The new limited edition hardback of The Transformation of Freemasonry is now out through Arima Publishing; it has been re-edited with additional discussions in certain chapters, all color prints (with additional prints in certain sections) and an extended index and bibliography. 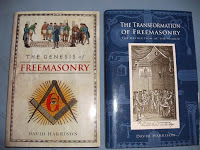 It has been designed to look like my first book The Genesis of Freemasonry (published by Lewis Masonic www.lewismasonic.com) for book collectors and collectors of Masonic works. The first 50 are signed by the author and the book is available direct from Arima Publishing www.arimapublishing.co.uk or telephone (UK) 01284 700321. This is only a limited edition so hurry while stocks last.